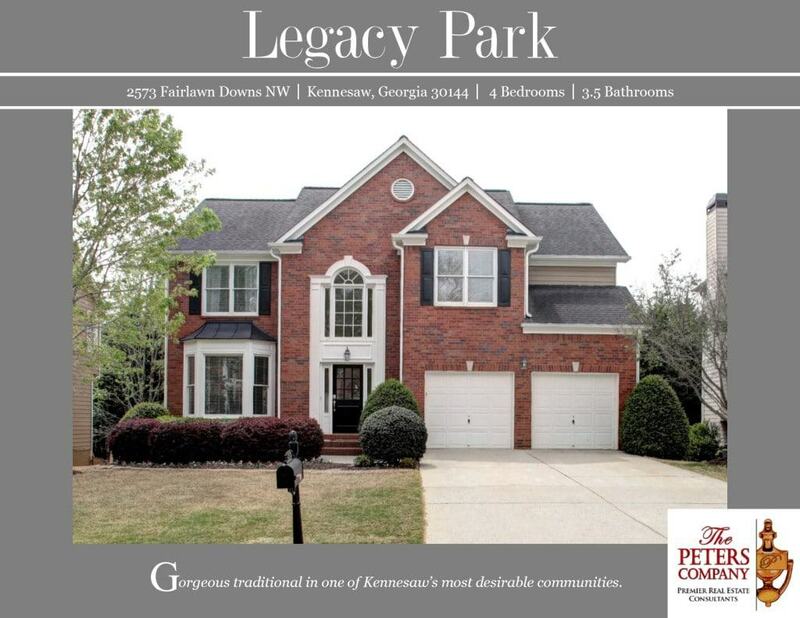 Just Listed :: Gorgeous Traditional in Kennesaw's Legacy Park! Welcome home! Nestled in the popular Legacy Park community, this home is just what you’ve been looking for. The flowing floor plan, custom features, and charming character will never go out of style. Being close to I-75, I-575, and Wade Green Road makes virtually all commutes a breeze. You’ll also have easy access to the other highways, byways, and activities that make this location such a well loved destination! Being in this popular area of Kennesaw means you can enjoy many nearby restaurants and shopping spots too! Legacy Park is known for its incredible amenities and activities including multiple pools, tennis courts, walking/biking trails, sports leagues, holiday events, and much more! · Chef’s kitchen features stainless steel appliances, granite countertops, custom cabinetry, tile backsplash, pantry with pull-out shelving, oversized island with breakfast bar, office nook, and breakfast area. · Family room boasts a cozy gas starter fireplace and is pre-wired with HDMI hook-ups. · Living room provides great additional living space. · Gleaming hardwood floors, fresh paint, and beautiful trim detail are showcased throughout the home. · The master suite is a true retreat including a spacious sitting room, trey ceiling, walk-in closet, and spa-like master bathroom with dual vanities, jetted tub, and separate shower. · Full finished basement with kitchenette provides additional living and lounging space along with a full bathroom and extra storage. · Two separate decks are perfect for outdoor enjoyment and entertaining. They overlook the fully fenced backyard.